I know I'm biased, but I do think the NHS is brilliant. And I'm not just saying that because private dental care has let us down. 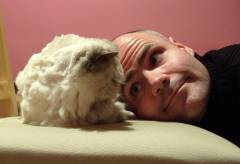 In the midst of the weekend's oral calamities, I've neglected to mention my own health problems. Oh yes indeed, when it comes to the family trophy for 'Most Likely to Die', I'm right up there with Lisa and Amelie. As it happens, I woke up on Friday morning with an ear infection. At the time I thought I might just have a bit of bath water trapped in my ear, and expected it to clear during the day, but having spent eight hours struggling to hear a word anyone said to me, I changed my mind. By Saturday I was not only deaf, but in pain, and on Sunday morning I was popping paracetamol whilst failing to hear Lisa asking "How's your ear?". But it was yesterday afternoon, when Amelie turned to me and said "Daddy, why is your ear green?" that I finally decided to take action. 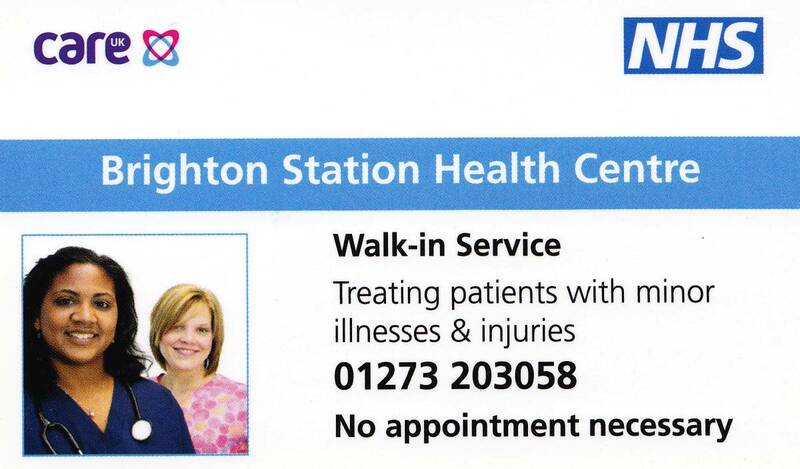 It opened in July 2009, and is run on behalf of the NHS by Care UK. In addition to being a normal GP practice, it's also open from 8am to 8pm, seven days a week, for walk-in patients from any surgery. According to their website, "The centre has been designed to help people with busy lifestyles who would like access to flexible and convenient health services". Which is me to a tee. I barely have time to phone my doctor during the week, never mind attend an appointment. As a general rule, the only doctor you can usually expect to see at the weekend is Matt Smith, and you'd be lucky to get medical attention at short notice without first hacking off your hand with a chainsaw and queuing up in A&E for a couple of hours. So it seemed a bit too good to be true. But the alternative would have been to phone my GP this morning, fight for an appointment, and then cause chaos at work by changing the rota to make it. Probably on Wednesday. So on the spur of the moment, I decided to pop into town yesterday afternoon, and put the walk-in service to the test by staggering in off the street. And very pleasantly surprised I was too. Within forty minutes of entering the building, I was being seen by a doctor. Let's face it, at a lot of surgeries, that doesn't even happen when you've got an appointment. The GP examined my ear, used the attractive phrase "full of pus", and then told me I need "a manly dose of antibiotics". Five minutes later I was handing over my prescription at Boots. So I'm now on 625mg of co-amoxiclav three times a day. I've checked the leaflet for side-effects, and apparently I should contact a doctor immediately if I get "a black tongue which looks hairy". So the moment Amelie stops mentioning my green ear and says I look like the Gruffalo, I'll be straight on the phone. In the meantime, I'm wondering if I'll ever see my own GP again. 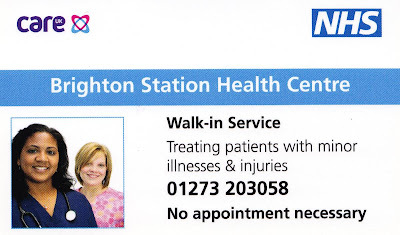 The Brighton Station Health Centre is open Saturdays, Sundays, evenings and bank holidays, and I don't even need to phone for an appointment or alter my work commitments. It's a hypochondriac's dream. I feel like I've joined Bupa for free. My GP's surgery is excellent. I can always get an appointemnt within 24 hours, and in an emergency can see a doctor that morning. And look at all the illnesses my GP can diagnose. It sounds brilliant. Can we all come? Didn't Amelie take a photo of your green ear? You and Dave are becoming quite competitive with all your ailments. I've just discovered we've got one at OUR station. I suppose its because I never travel by train that I haven't noticed it.